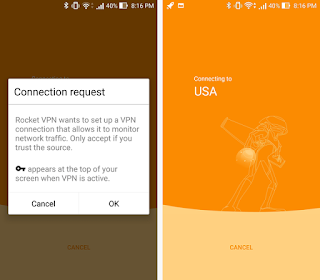 Rocket VPN Review: Is It The Best VPN App For Android? Do you ever worry while traveling or while connecting with an open public WI-Fi about security and privacy? Do you wish to protect your IP addresses over Internet? Or carve for anonymity for some websites? Do you want to access the contents blocked over the Internet? A VPN provides all this. It stands for Virtual Private Network. As the name suggests, it provides a virtual version of your private network. It adds an extra layer of protection over the Internet. It encrypts and protects your data over the Internet. You can easily hide your IP address and data by using this service. It secures the data between you and the business you are involved into. It works on the basic principle of tunneling. 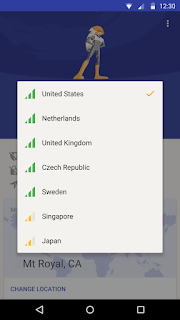 VPN give you access to the Internet through a tunnel, so you can easily use a different IP address and spoof any IP of a country of your choice. VPN provides an overall security and privacy between the user and the target server, with improved protection of data and anonymity of the Internet. For Android users, one of the greatest VPN service providers is Rocket VPN. It is a simple to use, comfortable and clean app. That saves you from the noise and clutter and offers an optimized way of encrypting your data. It takes around 19 MB and has been installed by around 5,000,000 people. Download the Rocket VPN app from play store. It is free to download. You can simply install it on your Smartphone. Tap the icon on the home page to open it. Then connect Rocket VPN to your VPN. A connection request will appear on the screen for the confirmation. Click OK.
From the list of provided regions. Choose the area, closest to you, hence making an optimal choice for your connection. After you have opted for the location, you will soon be connected to the VPN service. The default screen will be displayed. It has an orange color option button on the top right corner for turning the VPN on or off. It hovers in the right. 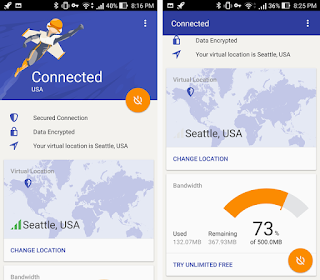 Rocket VPN also displays the connection status, virtual location and bandwidth available. Unblock the Internet: - Access all the content that has been blocked in your region by masking your IP address for some other location. You can rise from the barriers of geographically restricted information. For example, you can use the American Netflix even if you are not located in the USA. Surf Securely: - Browse without any worries. If you own an organization and employees, connect through a private network over Internet. You can secure the connections using this app. Quick Launch your Apps: - The rocket launcher allows one to create shortcuts to open apps instantly. Freely use Whatsapp, Netflix, YouTube, Skype, Facebook, Messenger, Viber, Kik, Snapchat and many more other application from anywhere, without any issues. Secure your connection: - Protect your data with the highly advanced encryption technology to keep your information safe. Protect Identity: - You can anonymously browse the web and avoid any third party from tracking your identity or location. Guard your privacy: - One can easily lock down the websites and apps from spying on their web traffic and block third parties. Customer service: - It provides top-notch customer care and secure email and calls support. Ease of Use: - It is a simple and an easy to use application. The design is clean and organized. The app does not cause any discrepancies during torrent downloads, or downloads from any other website. It also allows easy online streaming. The design efficiently incorporates Google's Material design and makes a uniform look across the Android device. Using any VPN can reduce your speed of browsing, this applies for rocket VPN too, but the speed is not reduced massively, it just slows down the speed a little bit. The VPN allows only 500 MB access for a month. For more one can go for pro plan offered by them. The price for unlimited data pack is $2.99 per month and $29.99 per year only. It is an optimal rate and the paid version also removes advertisements. Although you have fewer chances of encountering advertisements even for the free version. There is also a free trial period for seven days for the ease of users. 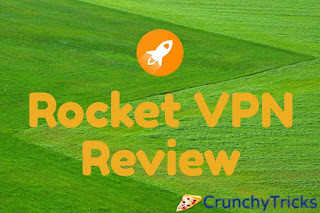 Rocket VPN provides a lot of services at a very reasonable cost. The application provides an easy to user interface. It can provide the daily needed protection and a fast and secure way of communication. This is one of the best VPN services for Android users. If you have never used a VPN, this is a great app to start with. And even if you are already using an application for your Android device Rocket VPN is worth a try.